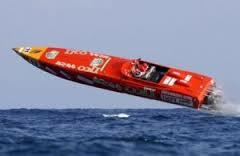 Offshore Powerboat Racing … as it used to be. As a child I had the privilege of growing up in a waterfront property. From a very early age I was allowed to play in boats and, by the age of 16 I was racing my father’s power boat every Saturday afternoon. At about the age of 17 I had an experience that changed my life. I accompanied a friend who drove and ocean racing powerboat from Sydney Harbour to the Port Hacking, in very rough conditions. I will never forget the excitement of surviving the leaps from wave-tops and the pounding of the landings. But my lasting impression was the relief, at dusk, of eventually entering calm waters, and at high speed, surrounded by a cacophony of noise and spray. As a result, I became, and remain, fascinated by those machines and the images of those men and women who battled the ocean in them. The boats that particularly interest me are the deep V hulls of the American powerboats that were raced offshore in the 1970’s in 1980’s. The first boat, KAAMA, driven by American grandmother Betty Cook, epitomised the struggle that men and women waged against the unpredictable sea. Because the races were conducted far off-shore, the only way to bring the images to the public, was from helicopter footage. The very fist and last scenes on this clip illustrate the speed of the boats and the amount of time they were airborne. Most of the boats were of a V bottom design and carried two 454 cubic inch Chevrolet engines. The engines drove either MerCruiser or Kiekhaefer outdrive systems, which allowed the boats to be trimmed by raising or lowering the angle of the outdrives. The boats also had adjustable trim tabs that allowed quick trimming of the attitude of the boat and many had forward water ballast tanks that could be filled instantly to lower the nose of the boat in heavy seas. The crews usually consisted of a pilot, who steered, a navigator and a throttle man, who set the speed, and retarded the throttles whenever the propellers left the water. Because of the pounding, the crew stood in bolsters to allow their legs to absorb the impact of the landings. The ever-present danger was that if the nose rose too high a a boat left a wave, the stern could strike the next, jamming the nose through the following wave. This could be very dangerous for the unprotected crew in the cockpit, and, in fact. caused a number of accidents, in the early days. In the 1990’s the boats were transformed into catamaran hulls, and the races moved in-shore, where the public could get close. In my view, there changes ended real “offshore” racing, forever. If you are interested in more information about this thrilling sport, there is an abundance of material on the internet. Educated in Sydney, Australia, Leon conducted a Legal practice in the "cut and thrust" of the Sydney Central Business District, for over 30 years. In 2012 Leon retired from his practice, to concentrate on his burgeoning literary career. Since that time Leon has published successful novels and penned a number of screenplays that have demonstrated serious potential.